Experience Charleston’s most unique holiday tradition in comfort aboard the Spirit of Charleston without having to brave the cold. 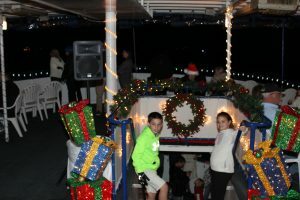 The Holiday Parade of Boats is a popular and beloved annual event, and we offer the best view in town. Your whole family will delight in the amazing sites of the parade while enjoying a delicious menu of crowd-pleasing Southern BBQ. Rockin’ holiday music will be provided by Ric Rush Entertainment. This cruise sells out every year and quickly – be sure to book before the seats are gone and you are watching from land! *Please note: we cannot accept cancellations inside 72 of departure time.